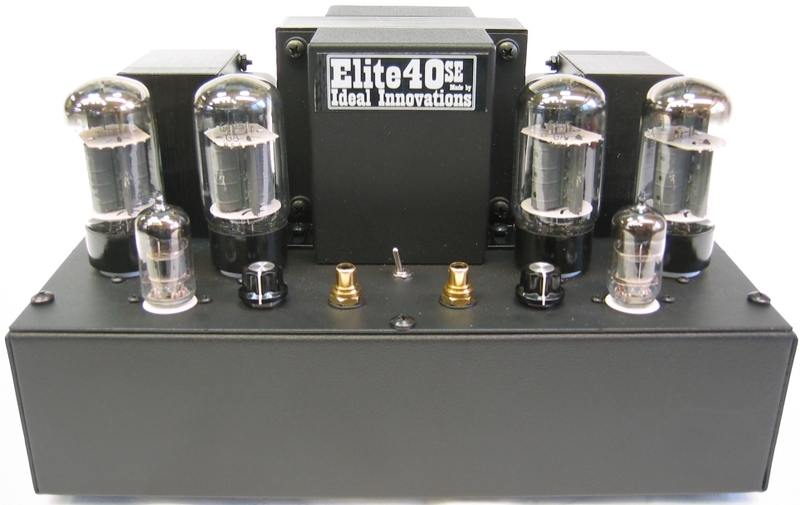 Due to many requests we have decided to launch a new Elite40SE model which is a stereo, 10 RMS watt per channel, Class A, single ended triode power amplifier. 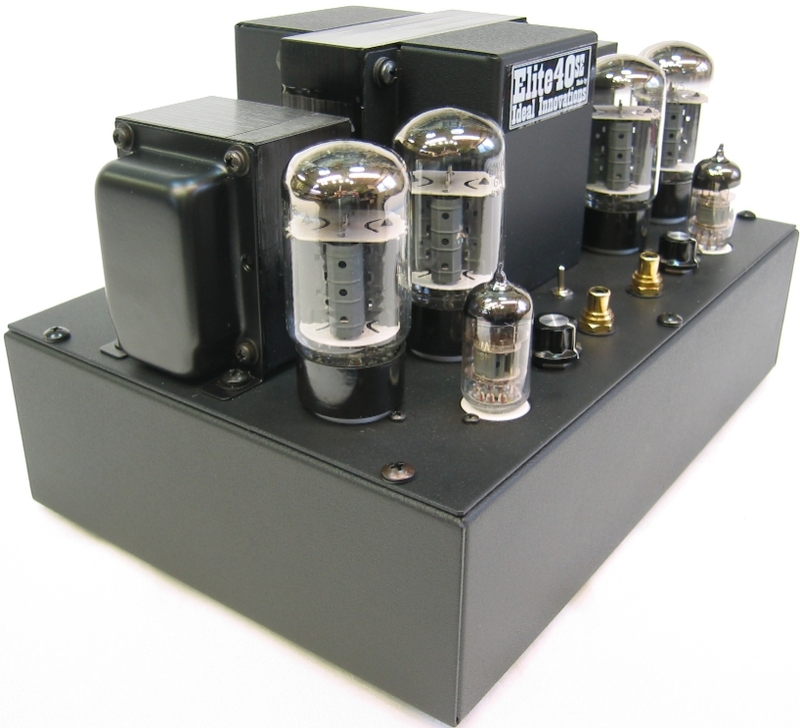 This amp uses two paralleled 6AV5GA power output tubes per channel wired in triode mode. Contact Us about current special Elite80 and Elite40SE pricing! These amplifiers have been thoughtfully engineered and meticulously hand assembled in Canada with strict quality checks done throughout the entire process. This amplifier is a Fixed Bias, Single Ended, Class A design with optional switching available for triode, pentode or ultra-linear operation. The power output tubes come wired standard as triodes. Comprehensive engineering tests are performed and a test report is filled out for every unit during the burn-in period to ensure proper performance. For those interested, a copy of this test report is available. You can see more photos here: Elite80 Photos, Elite4 Preamp Photos. This amp can be driven directly from a CD player with excellent results, eliminating the need for a preamp. Nearly any good quality preamp, solid state or tube will also work well with this amp. We WOULD NOT sell anyone an amplifier that didn't perform to our high standards during listening tests. Our name is on these and we want them to be right for decades. Power Output Tubes - 6AV5GA - A very well manufactured military tube, made in the USA, by Sylvania in Emporium, Pennsylvania in 1984. They are a very robust design with cathodes as large as a KT88�s. From info we have gathered these are actually 6FW5's labeled as 6AV5GA's. Originally made for demanding military applications these ideal power tubes provide unrivalled sonic performance in the correct audio circuit at least in our opinion, and we believe your's too once you listen with this amp. Power Supply - The power supply uses silicon rectifiers and is choke filtered for very quiet operation. Driver Tubes - 12AX7WA's. Some Elitexx versions may use 6N2P-EV (6H2n-EB) a very high quality, excellent sounding, near 12AX7 equivalent. 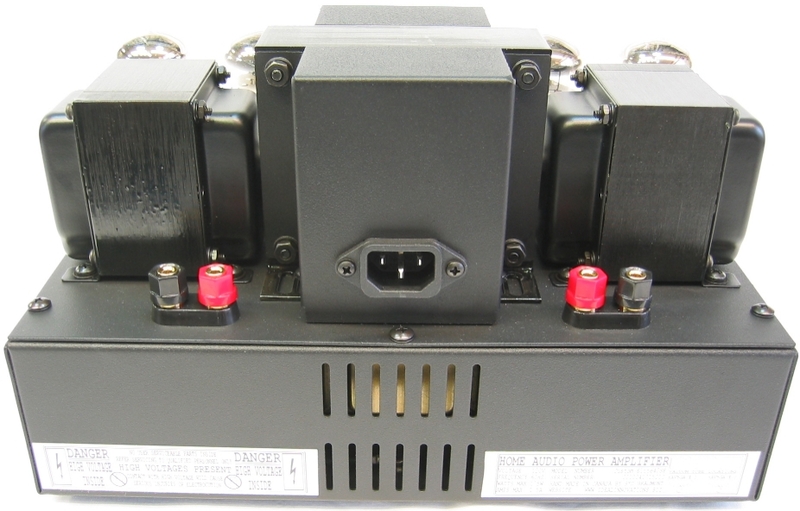 Connectors � Power: IEC320 Inlet, Input: Gold plated RCA, Output: 5 way Binding Posts on �� centers. A detachable IEC power cord is included. Circuit Protection � There are 9 internal circuit protection devices to ensure safe operation for all components and users. Documentation � This amplifier comes with a comprehensive owner�s manual. Audio Power Output � 10 Watts RMS per channel or greater than 20 Watts DAP per channel � both channels driven simultaneously. For more info on Dynamic Audio Power visit: DAP. Frequency Response - 20 Hz to 22 KHz plus or minus 1.0dB.  Input Sensitivity - 1.8 volt RMS signal will provide full output. Input Impedance � 100K Ohms. Output Impedance � 8 Ohms. AC Power Requirements � North America -120 Volts, 60HZ. Power Consumption � 85 watts idling and not more than 150 watts at full output. Dimensions � 12.0�(305mm)Wide x 8.0�(203mm)Deep x 7.5�(190mm)High and weighs 30 Lbs. (13.5KG). Transformers � All three, 1 power and 2 output are Canadian made to Ideal Innovation�s specifications and have been Hi-Pot tested at 1500 volts. The output transformers use M6 laminations and feature special interleaving. The power transformer and all AC components are UL & CSA approved. Chassis � All custom made heavy gauge sheet metal finished in black textured powder coat for maximum durability and good appearance. Small Components � Resistors are all ceramic flameproof and rated at 1 watt or more regardless of actual load and capacitors are all high quality for long life. Level control potentiometers are full size, not those little cheapies that wear out after a while. All tube sockets are ceramic with good quality pin sockets. Serviceability � Should the situation ever arise, this amplifier can be repaired in minutes, not hours. Take a look in the photos and you�ll see a very high quality PC Board that is made of an electrically rated 0.062" thick fiberglass with 2.5 ounce solder masked copper cladding. This Circuit Board is easily accessed from both sides and has no hot tube sockets or hot components mounted to it like many other brands. Instead everything is hand wired to the PC board which is also fully hand soldered to ensure perfect connections. We would like to think we did our homework here too. All Canadian customers will have to pay GST and in Ontario HST. Warranty - The Elite40SE amplifier comes with a LIFETIME GOOD PERFORMANCE GUARANTEE on everything. This warranty is subject to the terms and conditions of our Warranty policy as posted on our website. Returns � A full description of our return policy is posted on our website.